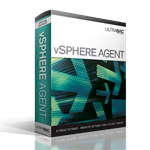 The vSphere Agent is available for purchase with UltraBac or UBDR Gold. This option performs centralized virtual machine backups without the disruption and overhead of running backup tasks from inside each VM. Changed Block Tracking (CBT) reduces the backup window and provides amazing restore speeds. The agent's ability to execute these incremental backups of virtual disks allows VM images to be updated every few minutes and recovered to a specified point-in-time. For a more comprehensive overview, please view the vSphere Agent Product Sheet.